In this system the rotary disk are in hold position, but when the linear length matches the actual required length to be cut the two disks with attached blades rotates. The rotation matches the linear speed of the wire and without stopping the wire the blades cuts the wire and stops at the home position and is ready to cut the next wire. Programming of the machine can be done with Touch Screen HMI. It is easy to use and is more user friendly. A disc brake is also fitted on the spinner motor for effective braking at the time of emergency braking. Moreover the life of the disk brake is more than other mechanical brakes. Machine is heavy and durable for trouble free production. Special steel is used for making certain things components which are under heavy stress. Working Space for Machine 5 mtrs x 35 mtrs. 5 mtrs x 35 mtrs. 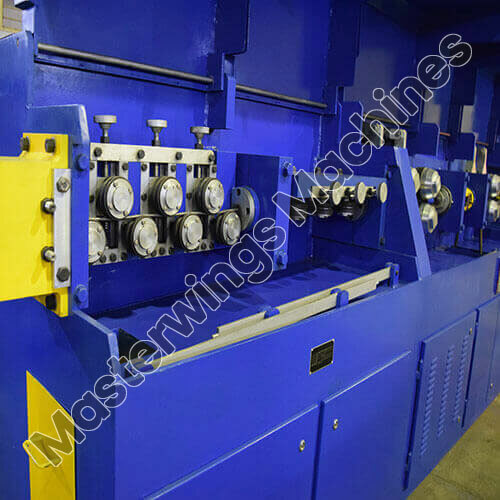 In order to keep pace with never ending demands of the customers, our company is instrumental in manufacturing standard quality range of Wire Straightening and Cutting off Machines Rotary Type - MWM 8RT, which is basically a wire cutting and straightening machine. This Wire Straightening and Cutting off Machines Rotary Type - MWM 8RT is highly appreciated amongst customers for its longer service life and hassle free performance. It is manufacturing using superb quality material which we purchase from our most reliable vendors. Furthermore, this machine is generally used for cutting and straightening of lain steel wires. Working Space for Machine: 5 Mtrs. x 35 Mtrs. We have been counted amongst the most trusted names in this domain, involved in manufacturing excellent quality array of Wire Straightening and Cutting off Machines Rotary Type - MWM 12RT. 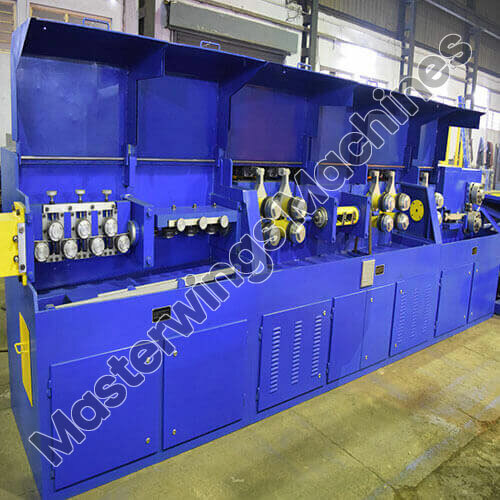 This Wire Straightening and Cutting off Machines Rotary Type - MWM 12RT is basically a steel wire straightening and cutting machine which is designed in our vast infrastructural unit using advance technologies. To ensure the flawlessness in its design, it is checked for quality as per the set industrial parameters under the supervision of our qualified professionals. Furthermore, to attain the maximum satisfaction of the customers, we provide this machine at most reasonable price.